Time: Walked in the door at 12:45pm, seated with food in 8 minutes. Heading North from Al’s Beef, we skip a convenience store and Central Camera and we’re at Kramer’s Health Food Store. 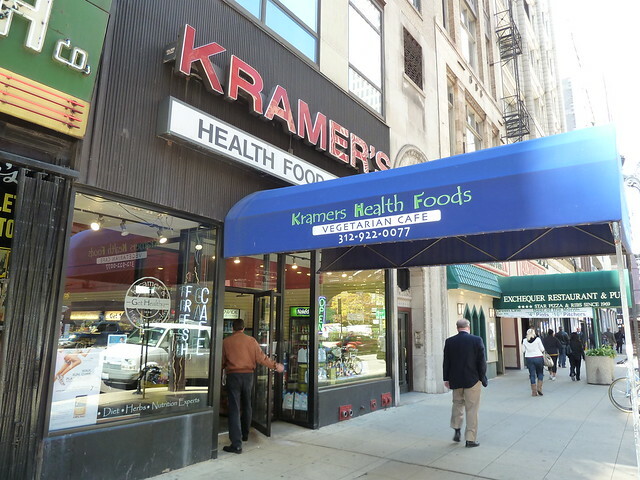 Kramer’s is a fairly large health food grocery store and at the back on a second floor overlooking the rest of the store is a vegetarian cafe. 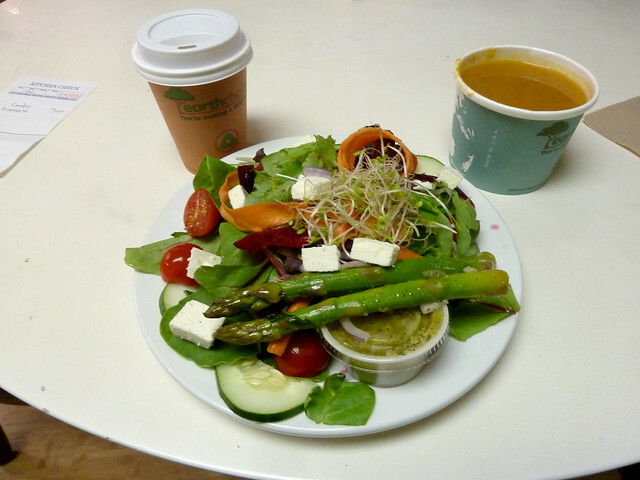 I went for a lunch combo, which gets you a salad or entree, a soup, and a small juice. For 50¢ more you can get a panini instead of the entree. I’m a sucker for the “house”-named anything, so I got the Kramer’s salad. The salad had a nice dressing and was pretty tasty, in a salad-y sort of way. The soup of the day was carrot-ginger, which I like, and this was a good one. I was rather hungry, but it was almost too much food—I had to work to finish my soup. I’m not 100% sure whether the juice was straight carrot or was their mixed vegetable, but it was also refreshing. Good thing I like carrots. There’s a good amount of seating, but the place was pretty crowded at the tail end of the lunch rush and so I had to ask someone to share a table. Max was kind enough to share with me and we ended up having a nice conversation. And then after lunch I interviewed one of the employees for ChicagoFlagTattoos.com, so it was quite a social workout. This page contains a single entry by Fuzzy published on October 12, 2012 1:43 PM. Loop Lunching: Al's Beef was the previous entry in this blog. Loop Lunching: Exchequer Restaurant & Pub is the next entry in this blog. An Index of Drunk Monkeys Episodes!